74 years ago, on Tuesday, April 20, 1937 actor George Takei was born in Los Angeles. Although best known for his role as Mr. Sulu in “Star Trek,” Takei has hundreds of television appearances to his credit, starting with a live episode of “Playhouse 90” in 1959. In his 2007 autobiography, To the Stars, Takei says he and his family were among more than 100,000 other Japanese-Americans who were sent to internment camps during World War II. Takei lived in Camp Rohwer in Arkansas and Camp Tule Lake in northern California. After the war, the Takeis returned to southern California, where George would eventually earn a masters degree in theater from U.C.L.A. in 1964. Takei’s life would change forever when he was cast as Mr. Sulu in 1965 for the second “Star Trek” pilot. 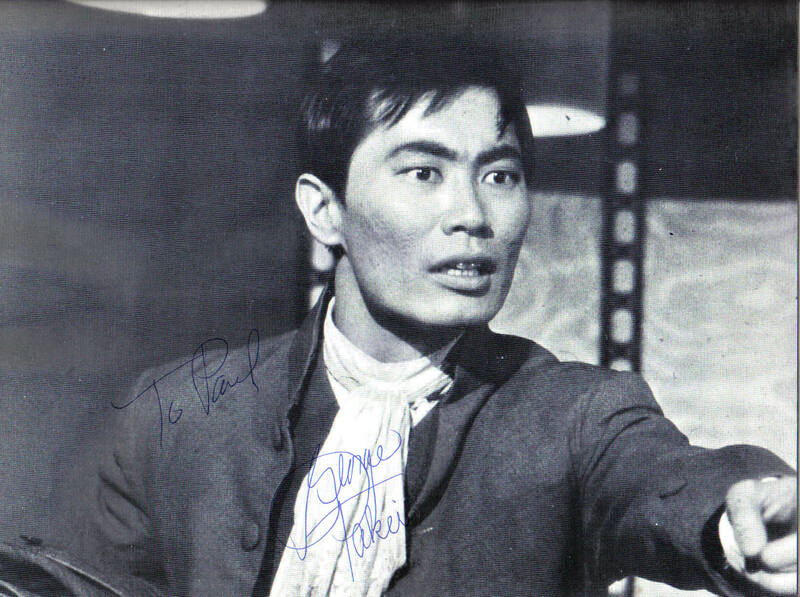 George Takei autograph signed in NYC, 1973. While some will only remember him as Sulu, George Takei’s acting career has lasted more than 50 years. Recently he had a recurring role on NBC‘s “Heroes” from 2007 to 2010, and this year he joined the cast of Nickelodeon‘s new series “Supah Ninjas” as Hologramps, the holographic grandfather. Takei may be the only TV actor (certainly one of the few) with an asteroid named in his honor. In October 2007 the International Astronomical Union‘s Committee on Small Body Nomenclature approved the official, scientific name of 7307 Takei for the asteroid, which is located between Mars and Jupiter. According to Takei’s own website, he and his husband Brad Altman made television history when they became the first gay couple to appear on “The Newlywed Game” on GSN cable network in October 2009. They won the game and donated their $10,000 prize to the Japanese American National Museum in Los Angeles. Happy birthday George… now warp speed to 75!